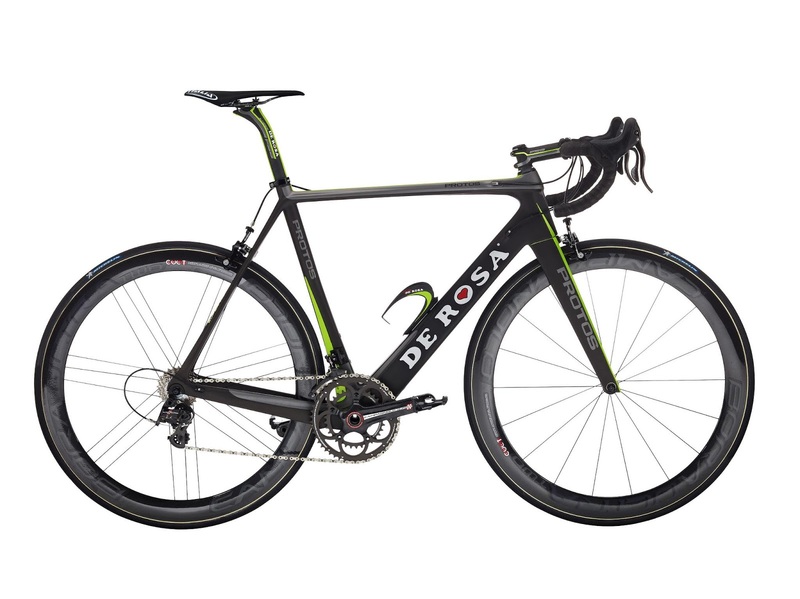 For 2013 the Nippo-De Rosa, a Continental Team, will be using a Protos model in black with a touch of green (click on image to enlarge). 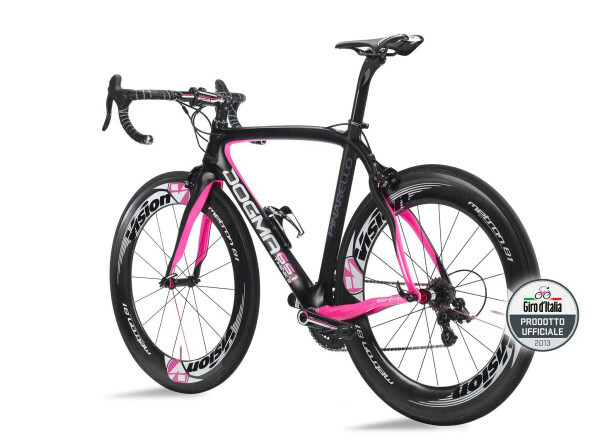 1) Lampre switched from using Wilier frames to Merida. 2) Colnago is missing as Europcar was not named as a ProTour team. 3) All the teams using Campagnolo are using the EPS (electronic) version. 4) Five teams are using Campagnolo components while ten teams are using Shimano and three are using SRAM. 5) All the Shimano equipped teams are using Di2; SRAM is the only mechnical group. 6) other wheelsets being used are Shimano, Zipp, Mavic, Corima, Vision, FFWD and Bontrager. The event is now officially called Campagnolo Gran Fondo New York, which signifies the strong partnership between the iconic bicycle components and wheel company and the iconic cycling event. Gran Fondo New York is the world's most international cycling event and draws a field of 7000 cyclists from over 70 countries to take on a 110-mile route from New York City to Bear Mountain, NY to Weehawken, NJ on May 19, 2013. The event offers a big personal challenge to its participants and an exciting, fun-filled destination trip to New York City for the whole family. While there are thousands of locals from the NY-NJ-CT tri-state area participating, there are also thousands traveling to NYC from Italy, Sweden, UK, Japan, Argentina, Brazil, Canada, Mexico, Chile, New Zealand, Ireland, Germany, among many other countries. In two short years, Gran Fondo New York has become a world-renowned event worthy of its classification among the largest and greatest cycling events in the world with media coverage in 17 languages and 30 countries. Campagnolo's founder, Tullio Campagnolo, is said to have invented the quick release while racing in the cold Alps in the 1920s. Back then, riders had to flip their rear wheel to use the smaller gear on the opposite side of the wheel. Tullio's hands thoughwere too cold to open the nuts so he had to ride the climb in the big gear. Coming home after the race, he invented the quick release to avoid such mishaps in the future. Since that pivotal day, Campagnolo has been at the forefront of cycling innovation. "Like no other company in cycling, Campagnolo combines rich heritage with modern technology such as the 11-speed electronic shifting EPS", says Gran Fondo New York co-founder Uli Fluhme. 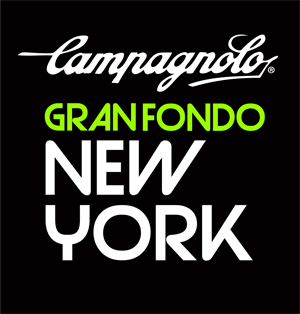 "I'm proud to have Campagnolo as a partner for Gran Fondo New York because I personally have been using nothing but Campagnolo components for over a decade. And like no other company, Campagnolo is committed to true, Italian Gran Fondo cycling where elite amateurs and recreational riders ride on the same course at the same time to do their best, whether that means competing for the win or finishing a challenging 110 mile course within the 10 hour cut-off time. At Gran Fondo New York we're glad to provide Campagnolo exposure to our participants from over 70 countries in general and US riders in particular." Last year, Campagnolo became title sponsor of Gran Fondo New York's partner event, Granfondo Roma, held this year on October 13. Both events showcase the future of the sport of cycling where riders and their families can combine a trip to the world's greatest cities with riding and competing on their bikes. Both events raise money for Operation Smile, the international children’s medical charity, proving that fundraising and goodwill have no borders. Participants and cycling fans alike will have the opportunity to test the latest Campagnolo components and talk with Campagnolo representatives at the pre-race expo of Gran Fondo New York, the NYC Bike Expo. Located at 33rd Street and 7th Avenue in midtown Manhattan, the expo is among the largest consumer road cycling expos in the world with 20,000 visitors over two days, May 17 and 18, 2013. For more information about the expo and to register for free as a visitor, go to www.nycbikeexpo.com. Gran Fondo New York co-founder Lidia Fluhme said: "Having Campagnolo as title sponsor allows us to further improve the GFNY experience for each and every rider at GFNY. Being racers ourselves that has been and will always remain our focus. Please welcome 'Campagnolo Gran Fondo New York'!" Worth noting: Mavic has a contest starting today for a front row seat in the Mavic support car at Paris-Roubaix on 7 April. The contest is open until Monday, March 4th, 2012 12pm (GMT+1). Filling in a simple registration form is the only requirement. The contest is restricted to people living in an European country and in the United States. The following story is used by permission of the author, Alwyn Jones, and was originally published in www.pedalmonsters.co.uk.The full story is entitled, "My guide to cycling La Marmotte and Maratona Dles Dolomites". If you also wish to read the La Marmotte section go here. Before continuing onto the story note that the random draw for this year's Maratona already took late last year. However, an additional further 190 entries will be sold online on www.maratona.it on March 27th 2013, check there for details. "My passion for cycling the most challenging and hilliest sportives I suspect comes from my roots living in the Conwy Valley in North Wales. Cycling up the steepest climbs we could find with our old Raleigh 5 speeds zigzagging our way up to the lakes above. Then suddenly the MTB was here and years of majestic riding and racing followed in the great forestry’s of North Wales. Then suddenly I found myself in Lincolnshire, and my passion for MTB and cycling began to wane. Simply put; not enough mountains or even the modest hill! My friend however persuaded me to buy a road bike and suddenly my passion for cycling was reborn. My first challenge was to cycle a 100 miles locally in the Lincolnshire Wolds which I enjoyed but was already hungry for the next challenge. Then the challenge moved swiftly to cycle the hardest British Sportive over 100 miles, widely recognised as the infamous Fred Whitton Challenge. Then after completing the Fred Whitton you naturally look for something even harder and I soon learned of ‘La Marmotte’ widely recognised as the most challenging of European sportives! After completing the La Marmotte three times in the French Alps my focus turned to the Maratona dles Dolomites in Italy and still my passion for sportives continues. 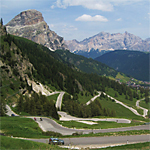 The Maratona dles Dolomites is one of Italy’s greatest Gran Fondo style rides. It is televised live and ridden by some big name retired ex professionals. Miguel Indurain was in the 2012 event. he Maratona is a mass participation event, and in 2012 attracted 31,600 applications for 8,800 places. Anyone can enter online at their website, but unlike the La Marmotte, it is a lottery. 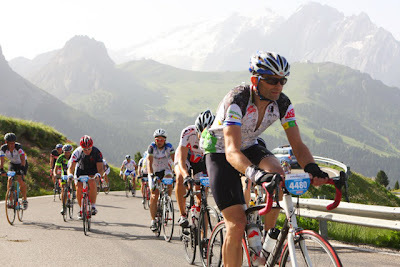 I was drawn to this event looking for a new challenge for 2012, after in previous years participating in La Marmotte. The event itself is not considered as hard as La Marmotte, due to the fact there is less vertical climbing (4190m) and it’s shorter in distance (138km). But the experience of riding in the picturesque and majestic Italian Dolomites and to ride up the same passes made famous by the Giro d’Italia makes this Gran Fondo a must do event. There seems little rest bite from the off as you climb 7 Dolomite Passes. Namely Passo Campolongo, Passo Pordoi, Passo Sella, Passo Gardena, Passo Camplongo (2nd time), Passo Giau and Passo Falzarego/ Passo Valporola. 8703 cyclists started the 2012 event from LaVilla. 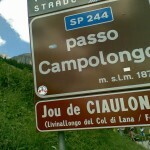 Within minutes you are climbing the first pass the Passo Campolongo wheel to wheel, shoulder to shoulder with thousands of cyclists. Cyclists jump for gaps ahead, cross your path, cyclists shout out aloud for fear of losing their partners, and worse of all for me, braking and coming to gridlock as your going up hill! Going up the next two passes Passo Pordoi and Passo Sella the crowds of cyclists slowly start to thin out. Passo Gardena follows with then a second ascent of Passo Campolongo which is much more enjoyable without the crowds. Once Passo Campolongo is completed the second time around a timely interlude from climbing with a faster section of rolling hills before the harder part of the ride begins with the relentless ascent up Passo Giau. Save yourselves for this one it’s the hardest part of the ride. After Giau the last long climb begins up to Passo Falzarego followed by the short extension up to Passo Valporola. After Valporola there is only 20km left. Downhill to LaVilla and then a steady incline to Corvara to finish in a blaze of glory. The Maratona in my opinion is a must do event. It is the best organised and value for money event I have ever done, at home or abroad. I’ve come away with great memories and I am already entered in Maratona 2013. 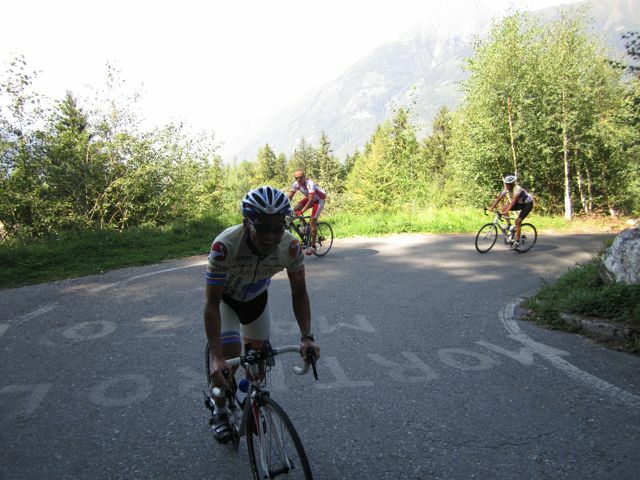 If you are interested in entering the Maratona in 2014 you can find all the information you need at their website www.maratona.it. Strava Leaderboard for Maratona dles Dolomites here. 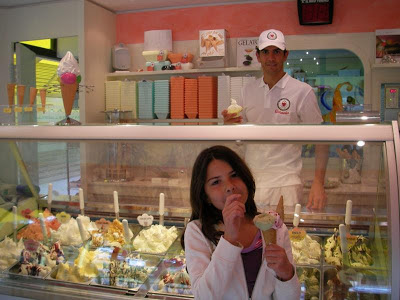 ......you will have to stop in the town of Buggiano at the gelateria "Ultimo Kilometro" (Last Kilometer). Here you will find Paolo Fornaciari, the owner, who during his career was a gregario (domestique) for Cipollini, Bettini, Bartoli and Cunego. 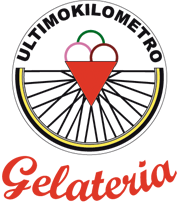 Although he only won one stage during his career (1994 Herald Sun Tour in Australia) he recently became a champion in the gelato championships in Rimini. 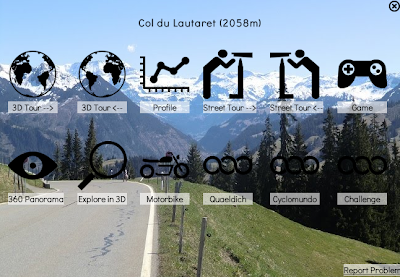 Why we like it: Cycling the Alps has it all: Street View, Earth View, a website, an Android app, a Chrome App, terrain, satellite and street maps. Let’s start with the web. Using the Google Maps API V3, Cycling the Alps gives you a great view of the Alps and the passes you can use to cycle through it. If you select a Street Tour, it will present a series of Street View imagesalong the route. You can select either direction that’s available. Continue reading in Google's Geo Developers Blog here. Antonio Colombo interview during 2012 Bicycle Film Festival Milano from Cinelli Official on Vimeo. The first weekend in March brings us two important races, the Strade Bianche on Saturday, March 2nd and the revived Giro del Lazio on Sunday, March 3rd. *This list of winners provided by RCS Sport. However, other sources show "no race" in 1940 and 1946 that are attributed above to Gino Bartali (1945 listed twice above, Zaurino Guidi was the winner). "Come and ride with me Eros Poli and let me help you discover ‘La Dolce Vita’ Italian style as only we Italians know how! We leave from Cinque Terre and cycle down the Mediterranean coast, through Tuscany and continue along the coast of the Tyrrhenian Sea to Rome. Here we are going to visit the ancient Roman villas of antique Ostia before climbing back on our bikes and cycling on to Naples. After crossing the Gulf of Naples by boat and visiting Pompei we ride south to Puglia where you will discover the Trulli of Alberobello and taste the real italian ‘Bruschetta’ made with the famous Altamura bread that will obviously be accompanied by one of their famous local wines! From Altamura we will move on towards Vieste, abandoning the coast to climb north through the center of Italy to Chieti and L'Aquila where we take a well deserved rest day. The last 5 stages we will pass through the beautiful historical towns of Spoleto, Assisi, Urbino and on the second last day we arrive in Cesenatico, the birthplace of Marco Pantani. Here I would like to take a few minutes to say hello by visiting is tomb..
After visiting Marco we will transfer immediately to Chioggia, a Venetian town that not only reminds us of what Venice would have been like 50-60 years ago but is also famous for its prosperous fishing in the Adriatic. The last stage: the final parade into Venice, along with our bikes we will board a water taxi in Chioggia that will take us to the island of Pellestrina where for lunch we are expected for succulent fried seafood and a cold beer. From Pellestrina on our bikes we ride to catch the ferry that takes us to Venice where to conclude our magnificent adventure I have been given special permission to have our photos taken as an awesome souvenir in Piazza San Marco. In the evening we will have our gala dinner." There are also possibilities of shorter versions within the schedule. All details, including day by day stage information, contact information, at www.eros-poli.com. To those that have not been following the blog for a long time, Eros Poli is best known for his Mont Ventoux Tour de France stage victory of 1994. He is also an Olympic Gold medalist (LA 1984), World Champion, and National Champion. Eros lives in Verona. Arguably, only Filippo Simeoni can claim to have lost his livelihood as a direct result of Armstrong's actions - and the Italian is not sure he can ever forgive the disgraced American. "I acknowledge Armstrong's confession on television but he put me through such a humiliating experience and damaged me so much, in terms of sport, morale and finances that I don't know if I could ever forgive him," Simeoni told Italian radio. 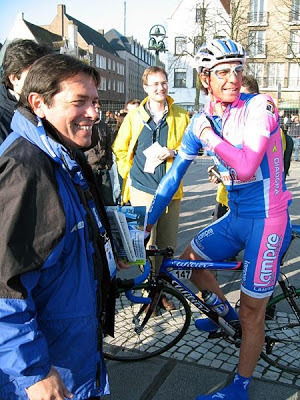 Despite winning two stages at the Tour of Spain and the Italian national title in 2008, Simeoni will forever be remembered for a feud with Armstrong that was played out to a global audience at the 2004 Tour de France. A former dope cheat himself, Simeoni had previously admitted to Italian magistrates to being treated by Michele Ferrari, a notorious Italian sports doctor. Simeoni told the court he had begun doping in 1993 and had been prescribed products such as EPO (erythropoietin) and Human Growth Hormone in 1996 and 1997, and advised how to use the substances by Ferrari. He maintains he never spoke of Armstrong. Instead, Simeoni's "crime" was to have exposed Ferrari in an era when the Italian doctor had direct links to Armstrong. The feud began when Armstrong labelled the Italian a "liar" in a July 2003 interview with French paper Le Monde. Simeoni sued for defemation, demanding 100,000 euros he said would be given to charity. A year later, Simeoni paid the price. It was the 18th stage of the Tour de France and Simeoni joined a six-man breakaway in a bid to fight for stage victory. Armstrong jumped out of the peloton and closed the gap, was followed by the T-Mobile team of rival Jan Ullrich, thus giving the breakaway no chance. After Armstrong refused to drop back, Simeoni was ordered to leave the breakaway group. When he did, with Armstrong in tow, the Italian was spat on and verbally abused by several leading riders including Filippo Pozzato, a fellow-Italian who recently served a ban for consulting with Ferrari. On the final stage, usually held at a slow pace as the race winner (in this case Armstrong) celebrates his win, Simeoni attacked repeatedly but was reeled in again and again. And spat on, again. Because Simeoni was a witness against Ferrari, the Italian authorities threatened to charge Armstrong with intimidation. But eventually, in April 2006, the defamation charges were dropped. Simeoni was always considered something of a maverick and his career suffered as a result. 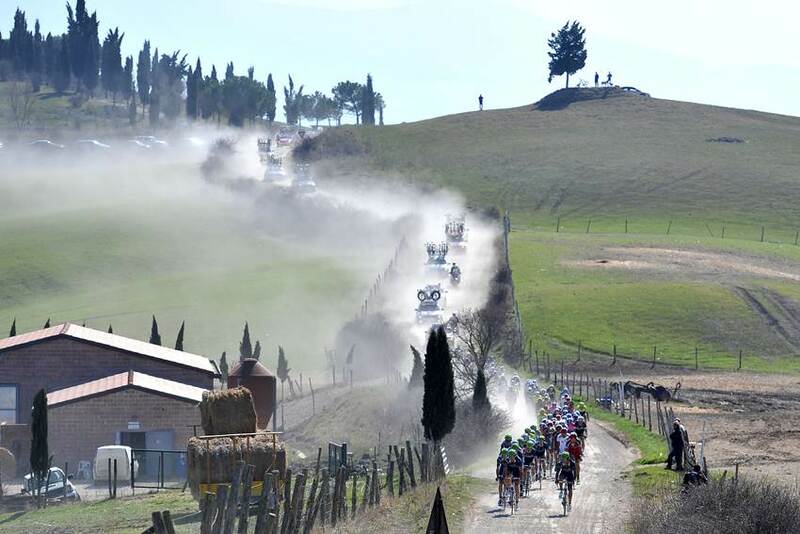 Now the the owner of two coffee shops near Rome, Simeoni feels Armstrong's confession has simply not gone far enough. "Honestly, Armstrong's words leave me feeling indifferent and in no way made up for all the offences, victimisation and humiliation I suffered," he said. "His admission was self-serving. He has to give a more complete confession in a way that will help cycling move on in a more positive direction." You are invited to the first Cinelli book presentation in France. 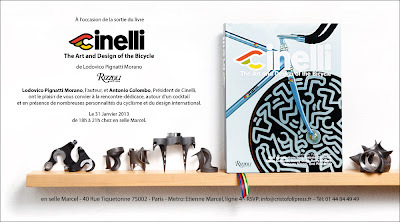 The event will took place at En selle Marcel bike store in the heart of Paris, on January 31st at 6pm. Click on image above for details. Andrea Sandrino Carrea, born in Gavi Ligure in 1924, the last of the "angeli di Coppi" has passed away. He was a professional from 1948 to 1958 and for much of that time rode as a domestique for Fausto Coppi. "He was a gregario par excellence," said the journalist Jean-Luc Gatellier. "The incarnation of personal disinterest... showing to perfection the notion of personal sacrifice. He refused the slightest bit of personal glory." Carrea was riding for Coppi in the Tour de France of 1952 when a group rode clear of the main field on the way to Lausanne. Carrea went with it to protect Coppi's interests. Carrea had no idea until he crossed the line that he had become the race leader. When officials told him, he looked bewildered, then distressed, and burst into tears. He had to be dragged to the podium. He had oustaged Coppi and he dreaded the consequences saying, "Without knowing it, I had slid into the important break of the day and at Lausanne, to my great surprise, I heard I had inherited a jersey destined for champions. For me, it was a terrible situation." As a result "Sandrino" then became the first to ride the Alpe d'Huez in the yellow jersey as leader of the Tour de France (the Alpe d' Huez was introduced into the Tour that year, 1952). The stage was won by Coppi who took the yellow jersey from Carrea and became first to triumph on the Alpe; Coppi would go on to win the Tour . For years after retiring, he rode up Alpe d'Huez ahead of the Tour de France, recognized only rarely by spectators. It was, he said, "A pilgrimage that nothing would make me miss." 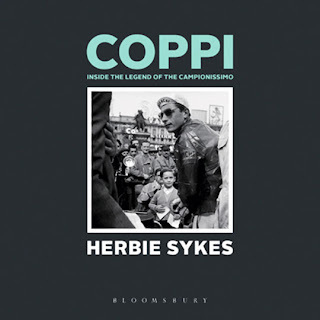 "Coppi - Inside the Legend of the Campionissimo" is a new book by Herbie Sykes. Published in hardback by Rouleur Books. The book includes never before seen images and first hand accounts from those who knew him. Sykes recently also authored Maglia Rosa. "Fausto Coppi remains the most iconic cyclist in the history of the sport. For twenty years either side of the war his extravagant talent, combined with a unique charisma and human frailty, captivated fans across Europe. Moreover, he revolutionised the sport of bike racing itself, laying the foundations for the generations who would follow. Coppi was Il Campionissimo; his greatness so unequivocal that his celebrity transcended mere sport. As such, both his professional and private lives were endlessly pawed over by his country’s insatiable post-war media. In deserting his wife and daughter for a divorcée in 1954, he traumatised Catholic Italy. Thereafter his life became a soap opera from which he was unable to escape until his dramatic death in 1960. Herbie Sykes’s new book Coppi is a beautiful and unique depiction of this legendary cyclist, built around an extraordinary collection of hand-picked, rarely seen images and testimonies from those who knew him intimately. These images, some genuine masterpieces, were unearthed through hours of painstaking research. Allied to the personal truths of those closest to him, they reveal the man behind the Fausto Coppi myth. This book strips away many of the half-truths and downright lies which have been grafted onto his legend over the decades, making it a very different kind of sports biography, and a must-have for all genuine cycling fans." Read a few sample pages. The Telegraph newspaper has run a series of photos (here) from the book. 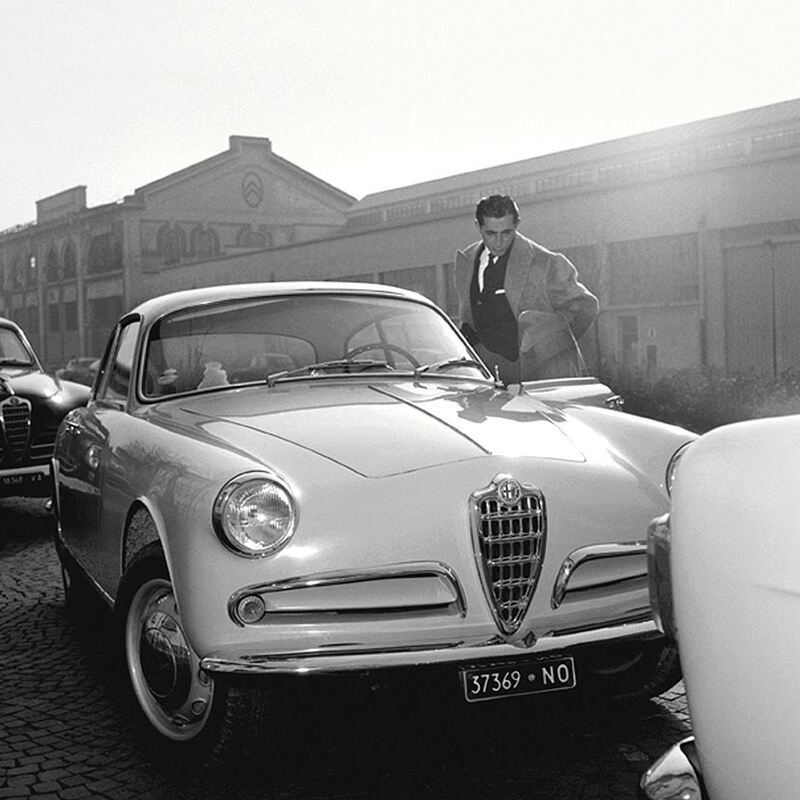 This is my favorite photo only because my dad had an Alfa like this. There are many stories and photos about Fausto Coppi in the blog. Use the search feature in the upper right....you won't be disappointed! We continue with the final part of guest writer Buzz Yancich's account of riding with Eros Poli (www.eros-poli.com) as they explore the Passo dello Stelvio. Part I here, Part II here and Part III here. I am here to report to you that everything you may have heard or read about the Mortirolo is true. There may be a climb somewhere that is harder – the infamous Zolocan I am told. But I haven’t ridden the Zolocan so for the time being this SOB is it. 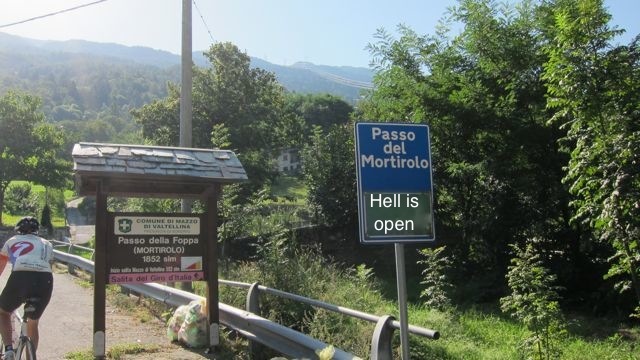 But I digress….before we get to the nasty stuff some pleasantries about our stay in Bormio. One of the real pleasures of traveling in Europe are the family run hotels that ooze character and charm. The Hotel Funivia certainly falls into that category. Like the best hotels the Funivia is family owned and operated and spotlessly clean. Moreover, the owners are cycling enthusiasts and are among a small number of hotels in Europe that actively cater to a cycling clientele. They have outfitted their hotel with a secured bike locker complete with a fully stocked work area, provide van supported rides throughout the region, greet returning riders each afternoon with tea, juice, pastries and provide daily washing of clothing kits all returned the following morning– gratis. The hotel is highly recommended and we are certain to return. We met for breakfast and while we lingered over a second coffee Eros laid out final plans and details for the Mortirolo. We would ride from the hotel along a secondary route which guaranteed few if any cars (for the record I think once we left Bormio we encountered zero cars) and then past a series of small towns until we reached the town of Mazzo di Valtalina where we would take a quick break at the bottom of the climb, hit the climb and then descend to Edolo where we would transfer back to Verona. Blue skies met us again as we departed Bormio but thankfully the temperature had cooled somewhat so that the first hour of riding was absolutely refreshing almost as refreshing as the fact that the first 30 kilometers to Mazzo are more or less downhill making for fast and easy kilometers and a nice way to get the legs going. On the road to Mazzo. Everyone knows about those days when you are on your bike and within a few moments you know you are going to have a great day. Mortirolo day was that way for me. I had plenty of energy and my legs were spinning easy right from the get go which was odd given the fact that I struggled on the Stelvio less than 24 hours earlier. I haven’t mentioned this yet but Kevin and I had been locked in an unspoken albeit friendly climbing competition. Well, it wasn’t much of a competition for Kevin aka “Marco” as Eros dubbed him as he mostly led and I most struggled to hold his wheel on the Gavia and Stelvio. But as I was already 0-2 on the KOM I needed something special for the Mortirolo so that I could at least make it interesting for him. 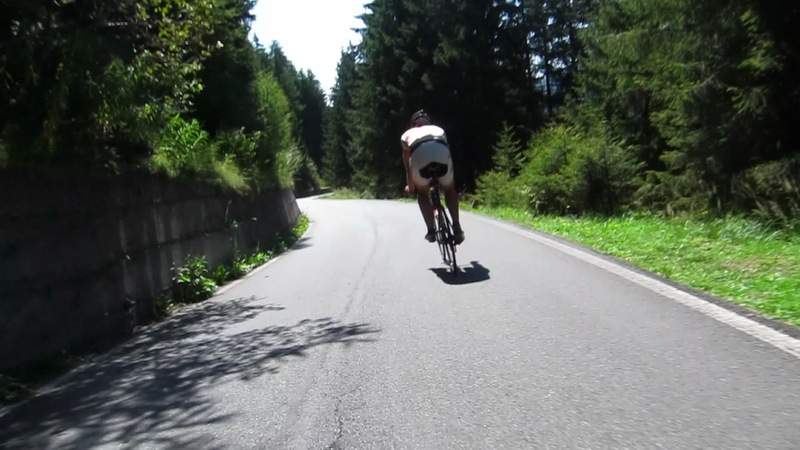 As we made our way to the base of the Mortirolo we came across a cyclist approaching us from the opposite direction, shouting and waving at us. Another Eros surprise: it was Lucca, a friend of Eros who had driven all the way from Milan to join us for the climb. Next, we came upon a large group of cyclists all wearing a red and white team kit. More friends’ of Eros? Not this time, instead an Italian cycling club of about 15 fit and serious riders but now friends on the road as they too were headed up the Mortirolo. About a kilometer before the start of the climb our small group pulled over at the side of the road to reorganize ourselves as we said ciao to the red and white cycling squad as they pressed on towards the climb. As it turns out they were doing a loop from Bormio over the Mortirolo and then up the Gavia over the same route we had passed two days earlier before descending to Bormio – approximately 115 kilometers in all. Good luck with that! After a quick bathroom break, top off of the water bottles and some energy bars we remounted and started the climb. The Mortirolo is unlike the Gavia and Stelvio in so many ways but the first is that there is no immediate Alp or glacier to gaze at and admire. Nor is there is a lot of fanfare to the start, just a simple sign and nothing that warns of the carnage ahead. Instead, the road immediately bends uphill past some farms and small apple orchards and STAYS IN AN IMPOSSIBLY VERTICAL POSITION ALL THE WAY TO THE TOP OF THE PASS 13 KILOMETERS LATER. We started as a group but it became immediately apparent within the first few minutes that this is “every man for himself” territory and we were all quickly reduced to our own pace. After two kilometers I was surprised to hear the first and only sound of discomfort I have ever heard from Kevin in all the years I have ridden with him. He muttered something about his back and some “language” expressing his displeasure at the ridiculousness of the grade. I pushed on and to my surprise by the next turn Kevin was 10 feet back and then 20 feet and so on. A perfect storm: I was on form and he was having a slightly off day. Any thoughts of racing up the Mortirolo however were quickly erased as the grade continued to stiffen and the reality set in that this is a climb of survival and one that requires great concentration, agility and patience. You are reduced to a one two, one two pace. If you hesitate or give up on a pedal stroke you will fall over. Nothing more is possible. It is that steep, unrelenting and cruel. Better still about 10 minutes later I couldn’t believe my eyes when I rounded a turn and ahead of me was one of the cyclists in the red and white team kit we had seen earlier. I grinded passed him one pedal stroke at a time but we didn’t say anything. He was hurting. Five minutes later I came upon another of his teammates. He too wore the same expression punctuated with heavy breathing and grunting. Passing these guys gave me a huge mental boost as I was looking for any type of motivation to keep going. Eros calls this “going fishing” as you reel in one rider after another. He’ll say: “Look, a little fishy…Oh, here is a big fish” as you collect one rider after another. The guys catch a fish. Dead fish: The next red and white “fish” I came across five minutes later startled me. He was stopped in a hairpin turn, sitting on a guardrail, his bike laying on the road, elbows on his knees, barely able to keep his head up with a beaten look in his eyes and we weren’t even half way up. If he was truly planning to do a loop which included the Gavia he was in big trouble. Meanwhile somewhere on the climb: It really is that steep. Even though the day was somewhat cooler I quickly went through my water but the cycling gods were smiling on me as just at that moment I came upon a lovely Tyrolian styled stone house with an outdoor spigot of water pouring into a stone trough. (I think it is around Tornante 14.) I stopped and was rewarded with one of the tastiest, cold drinks of water I have ever had. It completely revived me. I quickly remounted but because the severity of the grade I had to descend to the turn just below the house to get the pedals going. Where are the photographs?? As you can seen there aren’t many photographs of our climb up the Mortirolo except for a handful that Eros managed to take. If you do an internet search on the Mortirolo you will see the same three or four photos: the start, the Pantani memorial and the top. I always wondered why that was. Well, we soon learned there is a good reason for that: there simply is no way one can pull a camera out from your jersey with one hand on this climb and keep pedaling. Plus, stopping is just not an option. Oh, and don’t bother with that fancy array of 11 speed cassettes. As everyone who ides this beast knows you are reduced to your easiest gear within the first minute on the climb and it stays that way all the way to the top. Besides the sheer steepness of the road what differentiates the Mortirolo from the Gavia and Stelvio climbs is that much of it takes place in a forest. As such, it is extremely difficult to gauge where you are on the climb. There are a series of numbered Tornante signs but their placement is so haphazard that they don’t help you at all in figuring out how far up you are notwithstanding the fact that for every sign there must be another 5 unmarked hairpin turns. In reality, all you see is a few meters of road and then a bend. It is here where the climb really wreaks havoc with your mind. You keep thinking that the grade must surely let up, just there at the next corner…but when you reach the next corner thinking your legs can’t take anymore it just pitches up again...and you look up and see another section of climb and a corner and think it must ease up after that and minutes later you arrive at the next corner but there is no relief…the road continues up. This repeats itself over and over and over and what sears the memory of the climb into your cycling soul. There’s a neat monument to Pantani creatively built into the wall at Tornante 8 but with all due respect to Mr. Pantani there was no way I was stopping. I needed to end the ordeal as soon as possible. 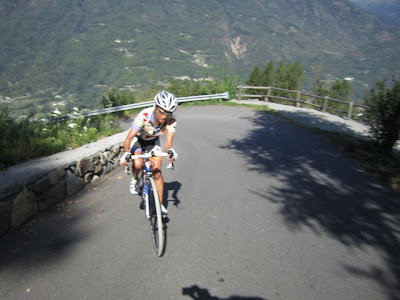 To give you an idea of how tough the climb is a friend of mine recently rode up the Mortirolo and upon arriving at the top asked where the Panatani monument was. He was so consumed by his effort that he didn’t realize he had ridden right past it. With about two kilometers to go Eros’ friend Lucca caught up to me. Thankfully he slowed and invited me to pedal with him to the top. It gave us a chance to commiserate on the brutality of the climb. Ironically, the only relief that comes on the entire climb is in the last kilometer when the grade significantly lessens to a mere 9 percent but by then the damage is done. Moreover, unlike the Gavia or Stelvio there is no spectacular view at the top. In fact, it is a cow pasture. A nice cow pasture and lots of clanging cow bells but still a cow pasture. Was this really the top? But that is the disorienting nature of this climb. A few minutes later Kevin arrived announcing that he had never done a climb where he practically spent the entire climb out of the saddle on his pedals. Enjoy it we did. Unlike the side up from Mazzo the descent to Edolo is a steady but manageable grade and kilometer after kilometer of smooth, curved roads that all the time head downhill. No hard braking is necessary just tuck and go. We encountered one car the entire way down. The descent was the cycling equivalent of a 30 minute fresh track powder ski run and elicited one word descriptors like “incredible” “magical” and “wow” at the bottom. It was the perfect finale to our three days in the Alps. Of course with Eros the day and surprises were not quite over. We arrived in Edolo, where we were ushered into a non-descript bar where we found a small dinning room in a back room with local workers eating a late lunch. Two steps into the dining room and the aroma from the kitchen told us we were in for a treat. No, its not on any website (I looked) and just more Eros magic. When we ask Eros how he finds these places tucked away all over Italy it usually starts with “Oh, a friend of mine…” We enjoyed a simple but delicious carbo ladened meal of polenta and veal stew before attacking a plate of big puffy zucchini blossom filled ravioli accompanied by table wine and bottles of sparking water. After lunch, we returned to Verona and enjoyed another few days of riding full of other adventures, characters and stories that will have to wait for another time. A week after we returned to California Kevin told us that he couldn’t get Italy and cycling out of his head. He’ll be back and so will we. Now it’s your turn! Details: The climb from Mazzo to the top of the Mortirolo is just under 13 kilometers at an average grade of 10.5% but with a spirit crushing 7 kilometer stretch averaging around 13%-14% with several sustained sections of 18+%. The descent from the top to Edolo is just over 17 kilometers. RCS Sport to Organize, Launch, "Dubai Tour"